I hardly cook lamb at home and can probably use the fingers on one hand to count the number of times I have actually done so. But I do occassionally order a lamb dish when dining outside. I know some folks can't stand eating lamb (maybe it's an Asian thing). They say that lamb has a strong gamey smell and no matter how you cook it, they simply cannot eat it. I personally don't have that issue, be it cooked in curries or western dish. 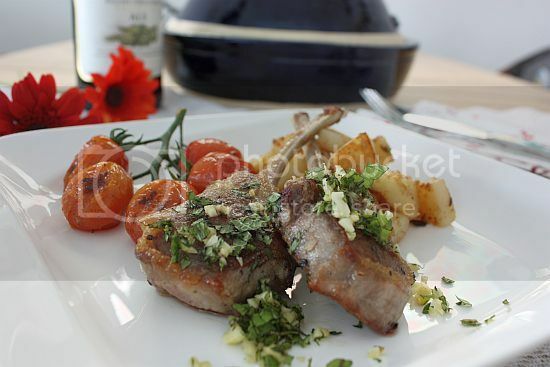 As I was cooking for myself only on a Sunday evening, I decided to buy a couple of lamb cutlets rather than a french rack. I think lamb cooked in a roast or grilled should be eaten immediately. The meat tends to get a bit tougher the next day. However if it was a curry dish, to me it always taste better the next day. This particular recipe was so easy to do that it was ready in less than 30 minutes. It's a simple dish but I think quite elegant to serve if you are having guests over. Best of all, you really don't have to slave behind a stove and get all sticky and flustered. 1) To make the gremolata, finely chop the mint, parsley and garlic together. Add in the lemon zest, combine and set aside. 2) Season the cutlets and leave for about 15 minutes. 3) Heat a chargrill pan to very hot. Lightly brush with the oil. Cook the cutlets over medium heat for 2 minutes on each side, or cook to your preference. Remove and rest the meat for about 5 minutes before serving. 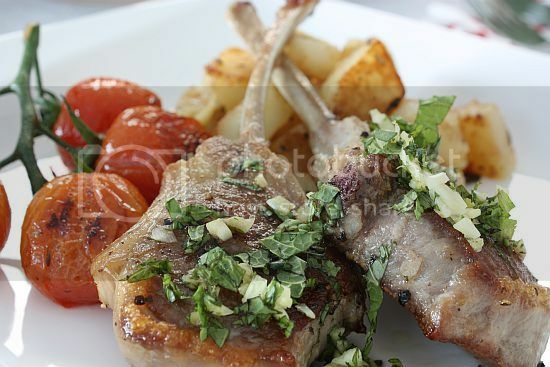 Sprinkle the gremolata on top of the cutlets before serving. 4) Serve the cutlets with your favourite vegetables or sides. I served mine with oven roasted vine tomatoes, seasoned with olive oil, minced garlic, salt and pepper. Together with this I added pan fried cubed russet potatoes seasoned with a pinch of dried mixed herbs, salt and pepper. 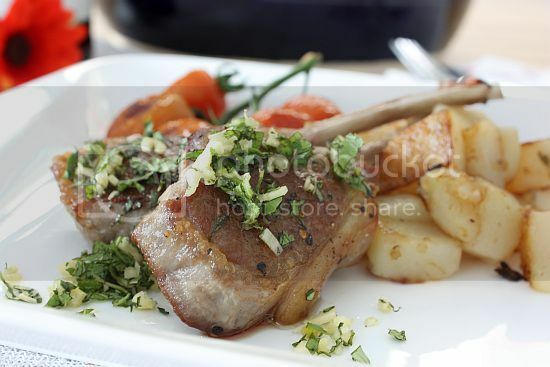 I'm not a lamb person but nevertheless it looks good and juicy! Now when are you cooking for me? hahahah... This one looks like having it in a hotel. Jo, your lamb dish looks so mouthwatering. I love the mint gremolate. 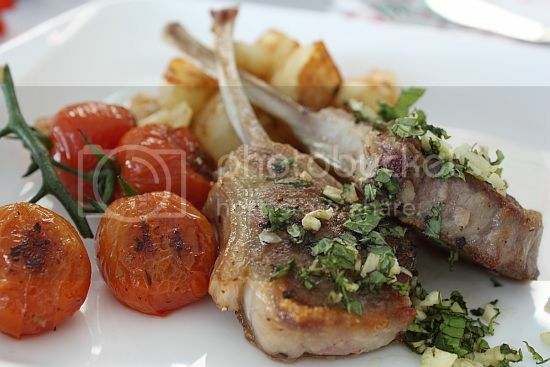 wow your lamb chops look so nicely trimmed :) the tomatoes look perfectly roasted too! I'd happy to eat by myself if I were served this dish ... I love Periplus mini cookbooks, too!